* Not have been treated for worms recently. * Or have some ailment you aren’t willing to medicate for. You must be willing to write your, (and your pets) experience in the Flea Free Organically​ blog. 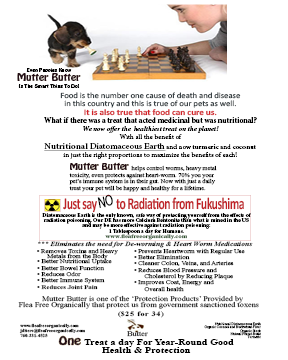 Mutter Butter helps control worms, heavy metal toxicity, even protects against heart-worm. 70% you your pet’s immune system is in their gut. Now with just a daily treat your pet will be happy and healthy for a lifetime. Mutter Butter can do a lot of things but it can’t treat heart worm. It can prevent it, but not treat it once they have it. Thankfully, there is not much incidence of heart worm in Southern California. Food is the number one cause of death and disease in this country and this is true of our pets as well. It is also true that food can cure us. What if there was a treat that acted medicinal but was nutritional? We now offer the healthiest treat on the planet! With all the benefit of Nutritional Diatomaceous Earth and now turmeric and coconut in just the right proportions to maximize the benefits of each! All of us, especially our pets should be thinking of the radiation threat coming from Japan. Diatomaceous Earth is one of the best, HEALTHIEST ways to treat it, for you and your pet. We are the few companies to offer Nutritional grade Diatomaceous Earth with more bio available Calcium Bentonite than food grade. 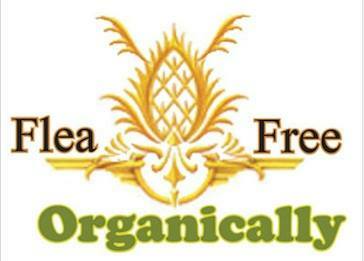 Research can be found anywhere on line or in the Flea Free Organically blog.